Step 1: After clicking the link, you will be taken to the signup page. Under "Create a new account", enter your email address, and press the "GET STARTED" button. Step 2: You will be sent to the "Upgrade to Full Access" page, where you'll click on the $179/year box, and press next to be taken to the payment screen. 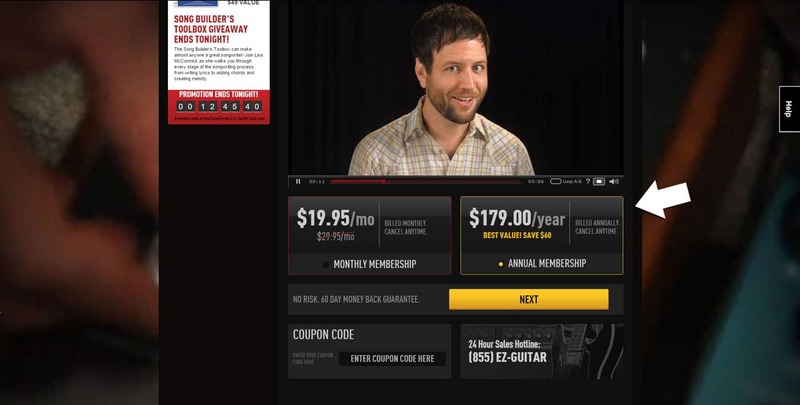 Don't be intimidated to sign up for the yearly play, as GuitarTricks.com has thousands of video guitar lessons. If you would want to learn all of the material, you would need years to do so. Of course, most people are just interested in learning the basics and a special genre of their choosing, and the yearly membership is perfect for this purpose. 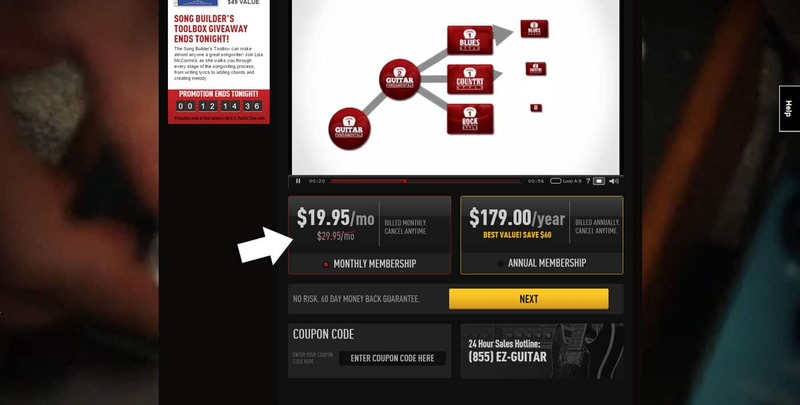 Step 2: You will be sent to the "Upgrade to Full Access" page, where you'll click on the Monthly Membership box. Step 3: Enter coupon code 60OFF in the coupon code box, and the 60% discount will automatically be applied to the monthly package. Click the "Next" button to go to the payment page. NEW: I found another discount code, which is good for an extra 20% off of the annual membership. 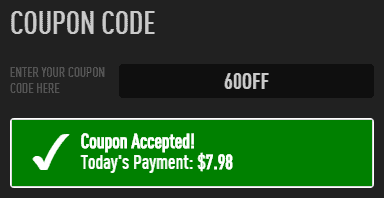 The code is SAVE20, just click this link and use it as outlined above. 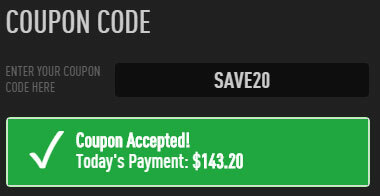 This is a really good deal, it brings the price down to $143 for the year, which means a total discount of $96! If you are unsure of whether you want to sign up and get the discounted pricing, why not test drive their services first? 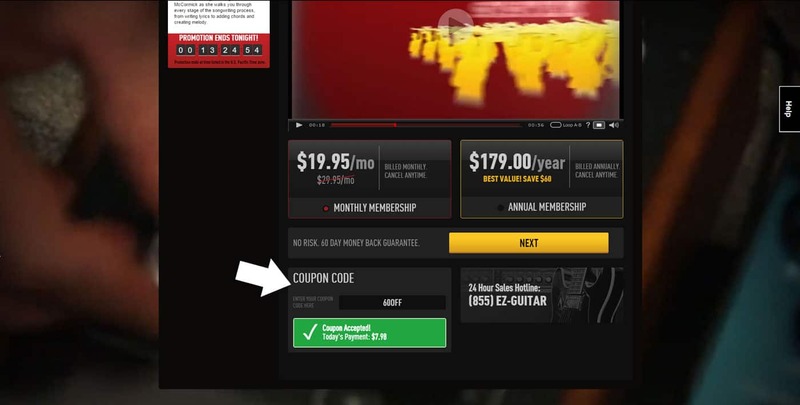 Once in a while, GuitarTricks will offer a special deal. This might be a free beginner's guitar with an annual membership, or a heavily discounted price. These deals come around 1-2 times per year. They usually have them around Christmas time, but it's not certain. You should see the deal right away, if they are running any promotions. If it only takes you to their home page, than they don't have anything going on at the moment. 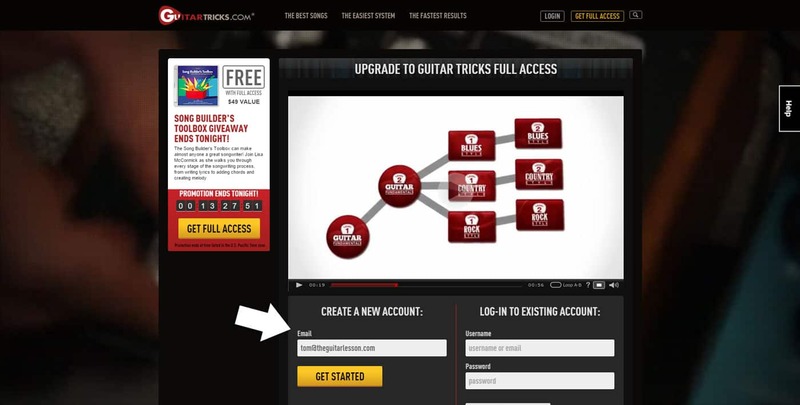 As you'll know from our review of GuitarTricks, you'll find thousands of video guitar lessons on the website. Here is one, teaching ska rhythm. Structured lessons, which will take you from a beginner to any level of playing you want. Genre lessons if you want to learn the specifics of blues, jazz, metal, pop, or a number of other styles of playing. Over 4,000 video tutorials, which can all be downloaded to your PC. Personalized interface, so you can track which lessons you've watched and learned.